What, if any, is the role of Christian love in the political sphere? Where politics is understood as the Machiavellian effort of securing power over others, of erecting barriers rather than of breaking them down, the answer is, most likely, ‘none’. The case is similar where Christian love is deemed to obstruct a Nietzschean will to power, where it is seen to breed nothing but weakness and resentment. Is Christian love not inherently paternalistic, as the problematic implications of traditional forms of development aid might suggest? Even a more favourable view of Christian love does not amount to its political relevance. Christian love, like other moral and religious convictions, is, so contemporary manifestations of liberalism tend to imply, a private matter. Good citizenship, so this argument would imply, rests on whether we hold to the principles of freedom and justice, keep the law, and cast our vote. Yet, can these important ‘public’ acts and commitments be separated from my ‘private’ life, from my interior disposition and, more particularly, from Christian love? The fact that the default mode in which we live our lives is one of indifference towards the other suggests otherwise. Retreating, by and large, into the private sphere of work, homes and cars, we typically vote only according to our own immediate (especially financial) interests; we have a flippant relationship with the law (tax law being a prime example); and we often look past the old, the sick and the homeless. These tendencies slowly but surely undermine our political structures and principles in a way that inevitably damages first of all those who are most vulnerable. And this, I now want to suggest, is because our sins of political indifference and materialistic individualism constitute nothing less than failures of love. They manifest a lack of passionate concern for the other and for the Good that unites all human persons. And it is for this reason that they present an almost insurmountable political challenge. For love cannot be politically enforced. One reason for this is that love, like its opposite, indifference, consists in a particular disposition towards the world. As much as it is an act, love implies a valuation of and delight in the other, a profound longing for the other’s well-being. And as such, love is inseparable from a particular inner life—from the cultivation of truthful perception for instance and of our conscience and, ultimately, of a life of prayer. For love is ultimately rooted in a love of Love itself—in that Spirit of Love which animates our own love. The political importance of our inner lives that follows from this is one of the modern state’s greatest challenges. For contrary to socialism’s assumption that the political sphere can foster, even produce, the kind of persons it needs for its own vitality (on the principle that a good society makes good individuals), love is not learnt through political programmes and policies but only through love itself—that is, through free relationships of love. And contrary to contemporary political liberalism, a state religion of neutrality and disinterestedness is likely to foster a hazardous sense of the political irrelevance of the inner life. What, then, is the political realm to make of the fact that love and, with it, the individual person and their inner life, form the inevitable foundation of a vital society? How can we acknowledge the political relevance of our inner lives without giving up on our liberal principles of freedom and toleration? An albeit rather personal response to this difficult question was, perhaps, offered by the new Pope Francis, minutes after his election. 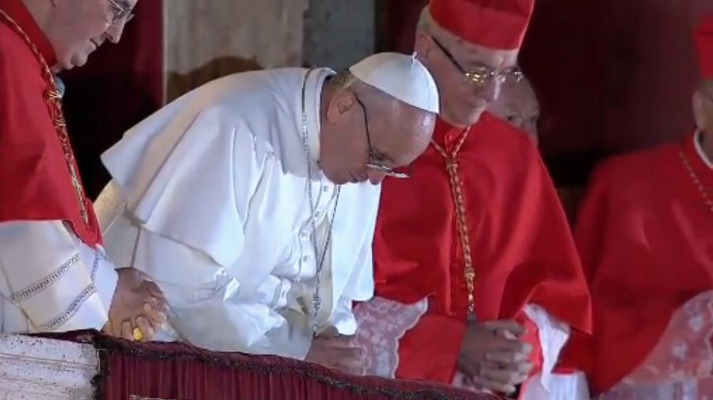 After greeting the cheering crowds, the Pope, a powerful leader, bows before them. And before giving them his blessing, he asks them to pray for his blessing. And rather than asking them to say the ‘Our Father’, he asks them to pray in silence, thus underling the simultaneously communal and individual nature of prayer. This act of humility is at once a political act and an act of love: the leader places his trust in his flock and unambiguously affirms the importance of each individual and his or her inner life of prayer and of love, for the whole. In doing so, Francis boldly proclaimed that even in a world tormented by war and poverty the individual’s turn inwards, Augustine’s reditum ad cor, is no luxury. Indeed, it is the first step towards building the fraternity of the true polis. Julia Meszaros is a post-doctoral researcher at the K.U. Leuven and a member of Anthropos, a research group in theological anthropology.